Tony Stone in "Severed Ways." Courtesy Heathen Films. Looking to help bring the experience of these explorers from a thousand years ago to life, I contacted filmmaker Tony Stone, writer, director, and co-star of the 2007 independent film “Severed Ways: The Norse Discovery of America.” I stumbled upon “Severed Ways” several months ago and was captivated by its simplicity, vitality, everyday realism, and unconventional story telling. It follows two Norse men struggling to survive and come to grips with the meaning of their lives in the wilds of North America when abandoned by the rest of their people. Here’s what Tony had to say about the new findings, his film, and the legacy of this extraordinary chapter from history. What ﬁrst got you interested in the story of Vikings in the New World? I wanted to know more about it when I heard brief mention of it back in the third grade. I wanted to know more about the Viking conquest in our own backyard. Spending a ton of time off the grid in the woods of Vermont and listening to a lot of Black Metal, these images of marauding Norsemen trekking through the wilderness returned. It fascinated me that America was almost settled by a somewhat Pagan population. There was more of a similarity between the Norse and the Natives, from their belief systems to the technological. The Vikings almost stuck around but ﬂed. Imagine how different this country and world would look if the Vikings settlement was successful. Europeans would have started coming to the New World much earlier. However, Europe was much poorer without concentrated power to fund large expeditions. And of course without technological differences. In 1000, a well trained arrow on either side was equally as deadly, regardless of whether it was constructed from steel or stone. The interaction would have been quite different than when Christians showed up with guns, canons, and germs 500 years later. How did you go about taking a few lines from a saga and ﬂeshing them out into a story of the daily lives of these explorers? The brevity of the Sagas makes them so engrossing. So much happens in one paragraph. But there is so much detail left out and so much more you want to know. I added in one line, stating that a couple of scouts had been left behind during one of their battles with “the Skraelings,” their name for Indians. Coming up with a new thread for the two scouts was a very natural process and a perfect way to create a new story dealing with primitive societies and self survival. Also, there is mythology in the Sagas, so interweaving some fantasy was natural too. 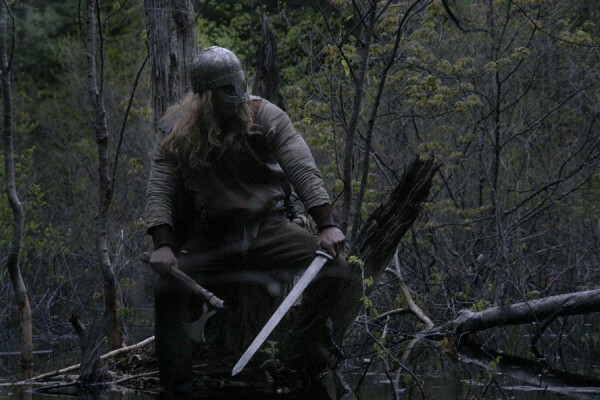 Norsemen set up camp in the Eastern Woodlands of North America in "Severed Ways." Courtesy Heathen Films. In “Severed Ways,” there’s a sense of a very ﬂeeting ﬁrst encounter. With the new ﬁnds seeming to indicate much more extensive contact and habitation, do you think the Vikings are likely to have traveled even further? Both settlements discovered in the last 50 years are described in the Vinland Sagas written over 800 years ago. They are quite accurate texts even with the ﬁctional elements within them. The Norse site at L’Anse Aux Meadows in Newfoundland was discovered by sailing the geographical description written in the Sagas, which was Liefsbudir, the base camp Lief Ericson constructed around the year 1000. Many of stories in the sagas, tell of other expeditions that set sail south from there and one expedition describes spending a winter at a location where it did not snow. They could have explored as far south as Virginia or beyond. Most historians agree that they probably traveled into the St. Lawrence and down the American coast. They’re just hasn’t been any concrete evidence found yet. And it might never. Any archeological site has probably been trampled and plowed on the American coast. It’s such a populated region. Plows or other modern machines probably have torn up any ﬁre pit or building footprint that might remain. But you never know what we might stumble upon. In your ﬁlm you used both surprising sound, like heavy metal music, as well as surprising silence, like when we see conversations happening in the distance. What were your thoughts behind using those techniques to tell this particular tale? It is a visual tale. The exact words are not important but the actions are clear. The music clashes with the natural surroundings as do these foreign white males marching around on some absurd glory mission. They are supposed to be out of place and the music reinforces that. The point of view of the ﬁlm is from nature, looking at these foreign beasts. The woods keep an eye on the animals moving through space. Watching conversations in the distance, the ﬁlmmaking becomes somewhat anthropological. When watching other species, we don’t understand their language; although it might just be grunts, it keeps our fascination just watching them move in the landscape. The ﬁlm is trying to have us view ourselves very objectively, as an outsider. But also by focusing on visuals, one allows the audience to ﬁll in the gaps. It can be a much more rewarding experience because the viewer becomes the co-writer. It seems these days most ﬁlms are made by writers and not directors. Visual storytelling is a bit of a lost art. Dialogue is not crucial for all ﬁlms, and a character/actor’s essence I ﬁnd much more fascinating to study. Body language and actions explain so much and are far more interesting to decipher than conveniently spewed words that act as mere explanation. Did the process of creating and telling this story change any of your ideas about the experience of the Vikings or Native Americans during this time of contact? I’m in love with their building and construction. They were incredible carpenters with very basic tools. The boat building was highly advanced, and the sod houses and grass roofs are unbelievable. And as someone who believes civilization’s collapse is a likelihood due to severe environmental degradation, their level of technology is at a perfect level for any future-primitive back-to-the-lander. They’re blacksmithing was quite simple, working at low temperatures. They did so much with low grade iron tools. Their amount of technology is enough to accomplish survival and live a beautiful life. Quiet moments like this where the men stop to catch their breath give "Severed Ways" a feeling of witnessing the real lives of these ancient adventurers. Courtesy Heathen Films. You mentioned your interest in sod buildings and other Norse structures, and that you have built some yourself. What is it that captivates you about these buildings? It’s captivating to be in them. There are no synthetic materials. There’s no reliance on outside supplies. Everything comes from a few hundred feet from the structure. You use the wood in the forest, and harvest the sod in the ﬁelds nearby for the roof material. Left alone in the woods, these structures can be constructed very quickly. The building I do relies on some power tools but much of it is hand-built from skinning logs and cutting trees down using axes, adze, and draw knifes, which the Norse used too. And if you touch all materials from beginning to end, you have a very special relationship with the structure. There’s something so sublime about the sod structures because they are camouﬂaged in the landscape, almost invisible. They are some of the most unobtrusive buildings I’ve ever seen. They look like sod berms rising out of the grassland with a timber frame structure underneath. And this allowed them to be extremely efficient. Along with the sod roofs, they used 4-foot thick sod and rock walls as insulation which contained much of the heat. Also, when they are completed it is the most effective way of time travel we have today. It is the only way that you can effectively know what it was like live 1000 years ago. Structures have such a dominating effect on your senses. It is simply powerful. Are you using the buildings for habitation or sets, or public visits of any kind? The open air sod roof barn is just a workshop area that I use for some ﬁlm shoots I still do in Vermont. It is supported by four growing trees that act as the posts. They go through the roof and sod grows around them. They are maples that turn bright red in the fall. There are chive plants and blueberries growing on the roof that can be harvested. The stave church is still under construction. The main structure is done with a diamond shingled wood roof. The decorative work is the next step. I plan to use the structure in a short ﬁlm but eventually it could be guest house. Finally, what do you think is the lasting legacy of the Viking visits to the New World? Impressive feats with basic practical technology. It is a lesson for all of us for back-to-the-land survival.